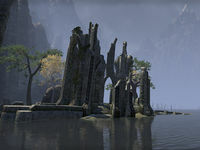 Veawend Ede is an Ayleid ruin on an island in northern Rivenspire, northeast of the Staging Grounds Wayshrine. It can be found by running west along the coast from Northpoint Wayshrine and through the natural cavern near Westwind Lighthouse. The ruin is home to a special crafting site, where you may craft items in the Magnus' Gift set.